I’ve been trying to balance working full time (and trying to grasp a job in a field I know nothing about but am learning more about every day) and trying to get our bathrooms (as in plural, as in TWO) back together again. “We” painted (remember, when I say “we”, you think “Kevin”). Actually. Kevin painted the room, I painted the windows. (I’m a better painter than what this picture shows. This was before “we” scraped the windows – they actually look pretty good). We painted our back bathroom a soft yellow. It’s like the color of a lemon drop (remember that candy?). It goes really well with our java-colored cabinet. We have another large cabinet to put back in there that “we” need to paint and put in there. “We” also need to put some towel racks up, the toilet in, and “we” (actually, I did help with that) just hung up a huge mirror over the sink this evening. Oh. And Kevin hung some vertical blinds, too. I’ll take pictures of the finished project next time – once we have this blasted thing FINISHED. 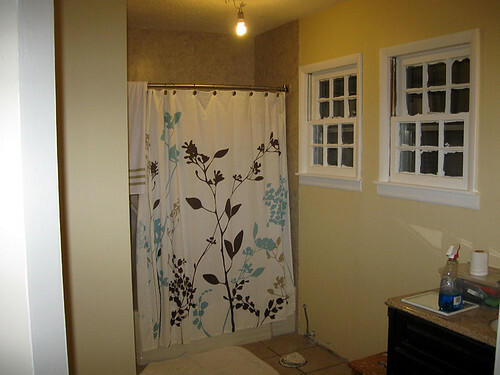 “We” also painted the front bathroom a soft lime green. We thought the soft green would also look really sharp with our java-colored sink we plan on putting in there. I painted the door (it was pretty gross, actually) and we bought some mosaic globes for our sconces that I LOVE. Only, they don’t give off enough light, so Kevin (I won’t even pretend there’s a “we” in this aspect of the project) will have to go into the attic this weekend and put in another light so it doesn’t throw the toilet area into shadow. I have a shower curtain for the shower that I’m really looking forward to putting up, as well. The electrician is supposed to come by tomorrow and finish his job, (hook up the lights, the vent fans [the boys are looking forward to this because apparently SOMEONE, *ahem*, is stinking up the joint], and another outlet in the back bathroom. The tile guy (OUR awesome tile guy), is coming on Thursday to do our floors. So HOPEFULLY, our bathrooms will nearly be done by this weekend. 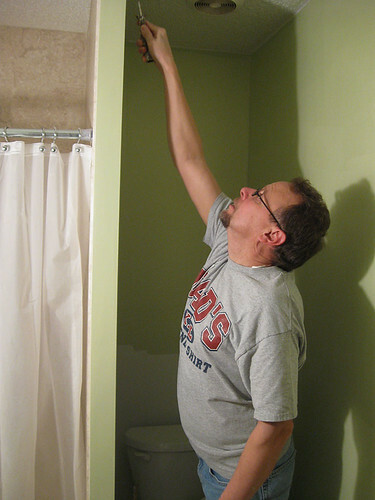 Our construction guys still need to install a corner shelf for the front shower, and there’s a small patch of ceiling that needs to be finished in the front bathroom, but FOR THE MOST PART (do not deny me the small pleasures in life, people!! ), we are nearly done. I’ll take you on another video tour once everything gets put back together again. This past weekend was non-stop motion for me and Kevin. He painted and did his thing, I gave the house a good cleaning because OMGosh, the dust was unbelievable. Then we both went back to work today. I’m pooped. But happy. Because our bathrooms are really turning out better than we hoped for. Sure. We had a few snags and setbacks and it’s only taken about TWO WEEKS longer than we had planned, but we’re nearly done now and I will KILL Kevin if he comes up with anymore home improvement projects in the next ten years or so. It’s now 8:30 – bed time. I know. Earth shattering, right? Kevin and I have been going ROUND AND ROUND on the number of shoes I own. I say, it’s NOTHING compared to what most women (or men) own. He thinks I have WAY TOO MANY. Can a woman have too many pairs of shoes?? At any rate … I need to prove him wrong. I have 26 pairs. Tell me that’s not bad?